Having a family member with special medical needs means facing all kinds of challenges. From a design perspective, creating a room that functions for these needs while providing comfort, cheer and inspiration to all family members is a call to creativity! Recently I had the exciting opportunity to help fulfill another wish granted by The Make-A-Wish Foundation of the Mid-Atlantic. 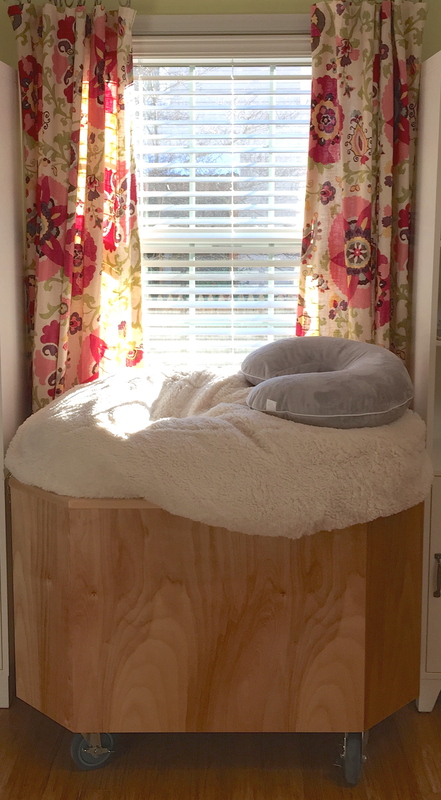 This dynamic family was looking to create a sensory room designed to both stimulate and calm their twin four year old boys who experience multiple disabilities. Special considerations such as dimmable lighting to reduce seizures, easy care carpet to manage spills, and a large scale movie screen for visual stimulation and family fun are a few features of the new living room. 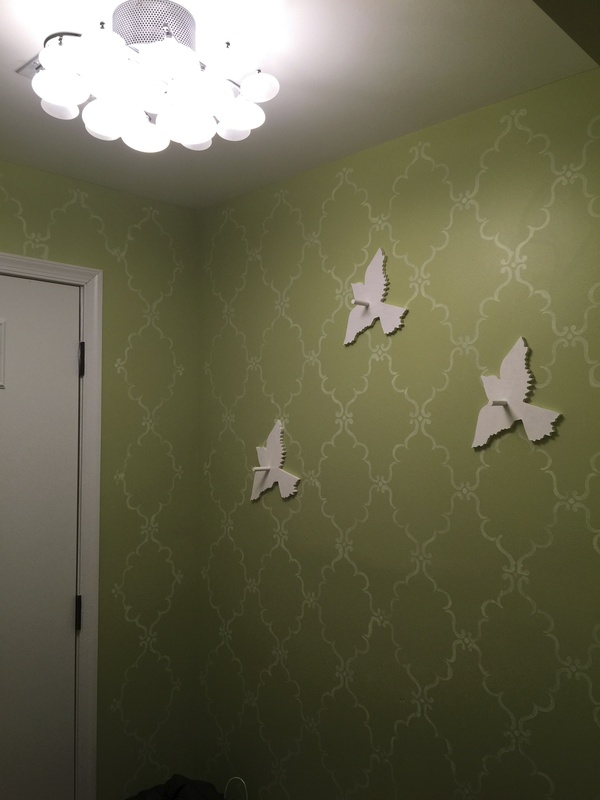 It was a joy to work with this family on creating their new room. I was inspired by the love and caring they share with their children, the resilience they demonstrate in the face of difficulty, and the delight they expressed in being a part of the design process. It was also heartwarming to interact with so many generous individuals and companies. Several times I found myself moved to tears as the person on the other end of the phone said “We would be honored to be your partners, how can we help?” I hope this posting does not sound like advertising but our largest contributors deserve mention. That said, I also want to note that 99% of the items in the room came with a greatly appreciated discount. 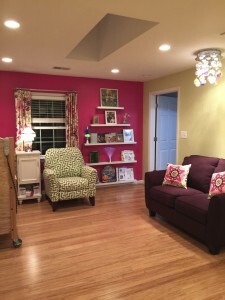 We began this design challenge as usual by gaining a thorough understanding of how this room needed to function, (living room, play room, office, nap and changing space, movie theatre). A careful inventory of necessary medical equipment was made and I learned about the kinds of seating that would best suit the two boys and each parent. When first hearing about the wish for big screen viewing I was struck with the notion of an old fashioned theatre with drapes to frame the vision. 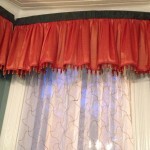 Using this as a jumping off place for the color scheme, the parents selected a modern blue and orange fabric to use for the drapes. 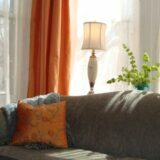 A heavy blackout window shade provided at an amazing discount by Next Day Blinds works perfectly as a large scale movie screen. A raised hospital bed takes up one corner of the room and is used for naps and changing. It has been incorporated into the style of the room through the use of dark blue sheets which de-emphasize the bed and is accented with wildly textured pillows which the boys like to stroke. A matching bed skirt was made to disguise and take advantage of ample storage underneath. Under the window a contemporary distressed wood buffet holds medicine and clothing within easy reach. A small scale modern desk for computing needs fits neatly into the corner and allows the caregivers and parents to work while having the boys within their sight. 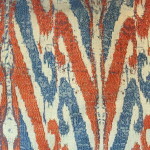 Carpet tile was chosen for the whimsical style, ease of cleaning /replacement and was generously donated by FLOR Carpet. Possibly the most fun aspect (from a visual perspective) is the large orange leather double reclining sofa. This easy to clean and texturally pleasing piece of furniture allows the whole family to cuddle together and was made possible through a generous discount given by Gladhill Furniture. 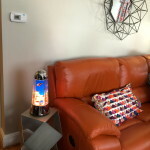 Other sensory stimulators such as the color changing candles, light projecting speakers and ethnic musical instruments were included not only for their sensory input but for their visual appeal as well. 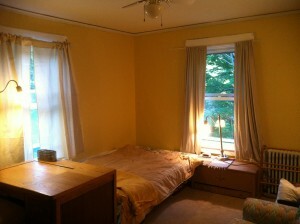 We almost painted the room a vivid blue to reflect the parents love of bold color. In fact, the blue of the Greek Islands was the beginning of our color exploration. 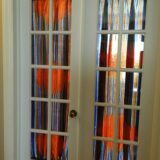 But this is the cool way that good design comes together; after trying several samples we decided that since this was a living room, and the entry into the home, it would be wiser (saner?) to use a more neutral tone and let the furniture and accessories carry the stimulating colors. Beautiful Home Services partnered with Make-A Wish on this piece of the project by providing their wonderful painting services free of charge. 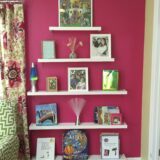 Creating a room that is stylish yet highly functional for someone with medical needs does not have to be as tricky as it sounds. The key components in incorporating medical equipment into a residential space are to pay close attention to the color, size and function of the needed features. In this sensory living room careful space planning allowed for the storage of a hoyer lift between the desk and sofa. It moves easily in and out of this space but does not take center stage because of the blue sling. The projector and emergency medical equipment roll easily where needed but are unobtrusive on their stylish navy rolling bar cart. Large specialized chairs were custom made by Specialized Orthotic Services for the boys and covered in blue to make sense within the space. Two little girls with medical needs, two nurses, two oxygen tanks and respirators, two TVs, clothing, specialized food and feeding devices, 800 DVDs, oh and yes, a place for Mom to sit – in one room. This was my most recent challenge from the Make-A-Wish Foundation. This beautiful family has adopted two very disabled little girls ages eight and thirteen. 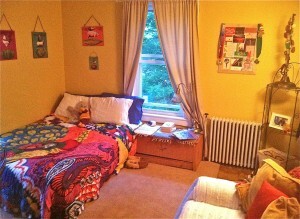 They are lovingly cared for in one large room of the families’ home. You can imagine the many issues involved in the room re-design, primarily space planning and storage for all of the above. To promote the safety of the eight year old who is very mobile but feels no pain, the family requested a Hannah bed which the company made possible by offering a significant discount. 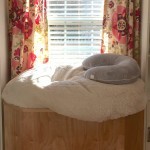 This bed provides comfort and safety for little Faith who is constantly on-the-go. As you can see it takes up a good 1/8th of the room. The next piece of the puzzle was figuring out how to create a space for the TV as the family owns over 800 videos which keep the girls entertained and smiling. Omnimount to the rescue. This company generously donated a Play 25X TV Mount and a Tria shelf for the DVD Player. This arms reaches out over the oxygen tank and tilts downwards for Faith’s optimum viewing on her new beanbag chair or from within her Hannah bed. Every corner of this room was tapped for storage. One closet was converted to a food preparation area with floor to ceiling cabinetry. Another closet was reconfigured to do double duty storing clothing and medical supplies. A large secretary desk functions as work space for the nurses to complete and store their paperwork. 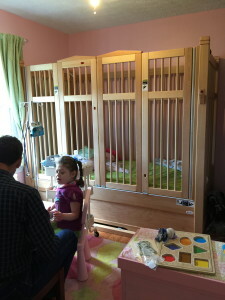 We took advantage of the raised crib and added under the bed rolling storage drawers. With the 36 inches left of wall space we found room for a window seat/toy box for Faith who loves to look out of the window. Once the space planning was complete and the functional needs addressed then came the fun part. 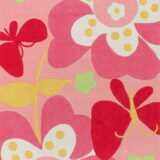 Mom fell in love with the pink multicolored rug featured at the top of the page. 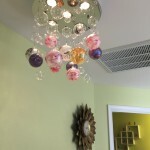 The room came together based upon this fun “girly” color scheme of pink, green and yellow. 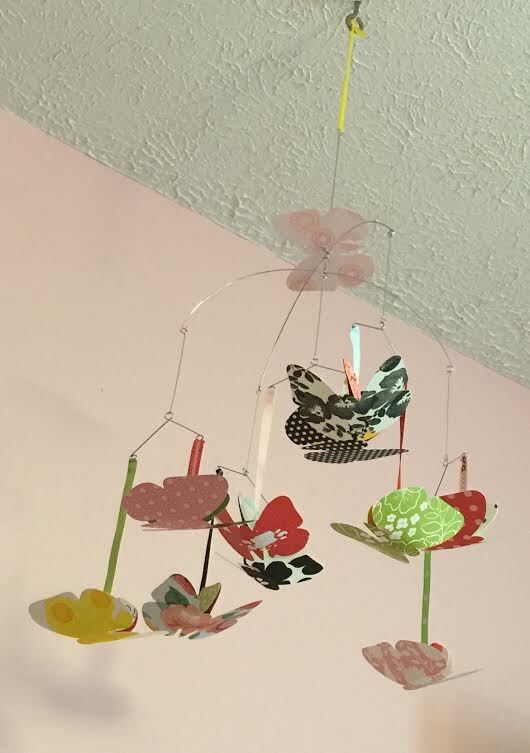 My favorite feature is a custom made mobile created and donated by Karen and her daughter of Almost Sunday. 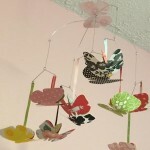 The family loves butterflies and the room called out for pink and green. Jenni has limited sight but registers objects colored in black and red. 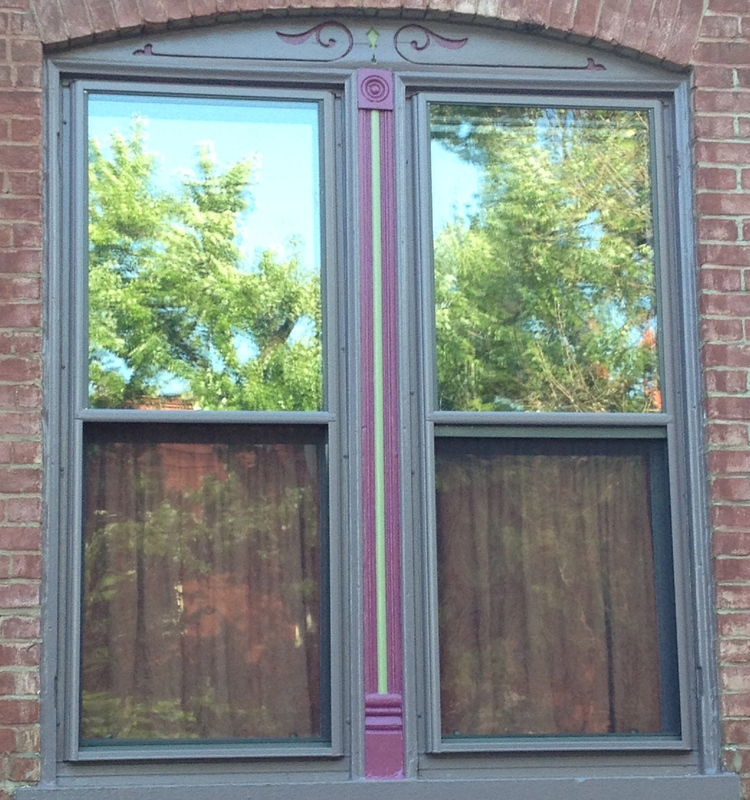 Voila, this artist conjured up the perfect finishing touch! 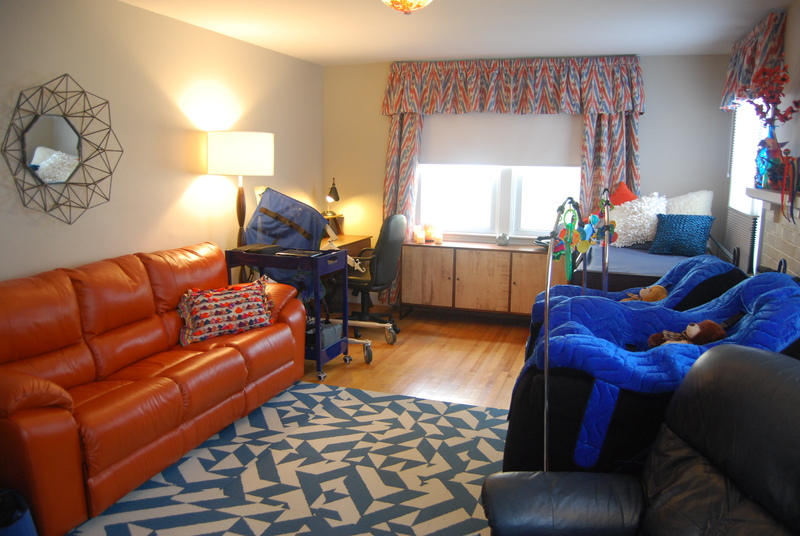 With the extra storage and cheerful new color scheme both girls, their family, and many caregivers are now set to enjoy their highly functional new space thanks to The Make-A-Wish Foundation! I recently had the honor of being asked by the Make A Wish Foundation to design a new bedroom for a teenage girl named Cyrel who lives with severe disabilities. We began by determining how her room would function with the dual goals of creating an enchanting bedroom as well as an inviting space where family and friends could gather with Cyrel. The fresh color palate (Peony Pink and Wales Green by Benjamin Moore) was inspired by the fabric in the bespoke curtains chosen to create a feeling of lightheartedness. A hip new graphic patterned recliner donated by Belfort Furniture, and a new aubergine love seat helps people visit in comfort. A new eco-friendly bamboo floor donated by Lumber Liquidators adds to the feeling of warmth in the space. 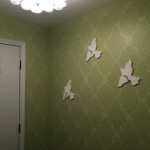 The entry to her room was hand stenciled, inviting Cyrel and her visitors into this special new space of her own. Next we considered what kinds of equipment would enhance Cyrel’s life experience. 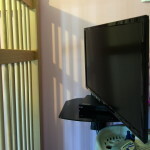 A smart TV was installed over her bed on a flexible mounting arm donated by Omnimount that swivels, raises, lowers and tilts for viewing in all kinds of positions. A raised cart was built by master woodworker, Jon Haberman and his apprentice Laurent Diot that houses a large beanbag chair. This device rolls and allows Cyrel to be in her most comfortable position while also at eye level with folks who are in the room with her. The third factor in the design process considered how to reflect and enhance Cyrel’s adolescent developmental stage of life. The task of understanding oneself in relation to others prompted a wall of pictures showing Cyrel with family and friends from her specialized school. (Not pictured for privacy reasons). 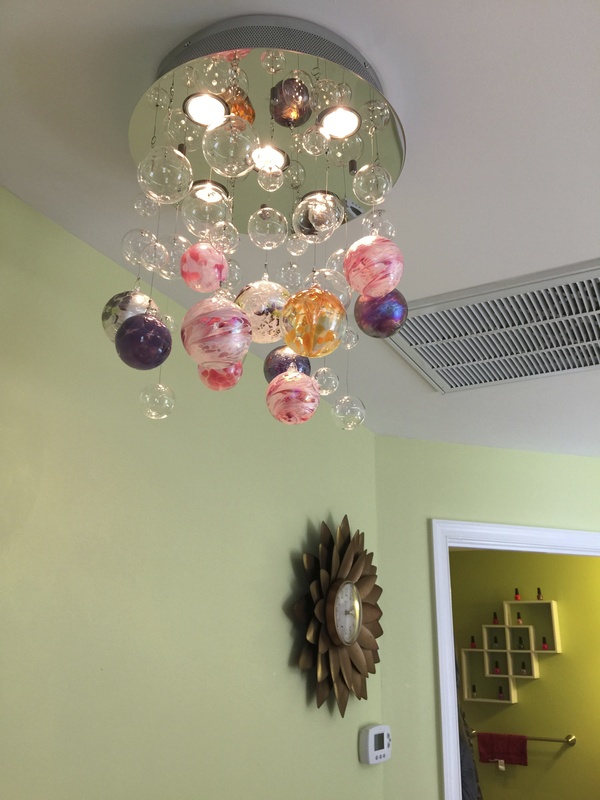 A myriad of other features were added to enhance Cyrel’s sensory experiences and reflect a teen sensibility. 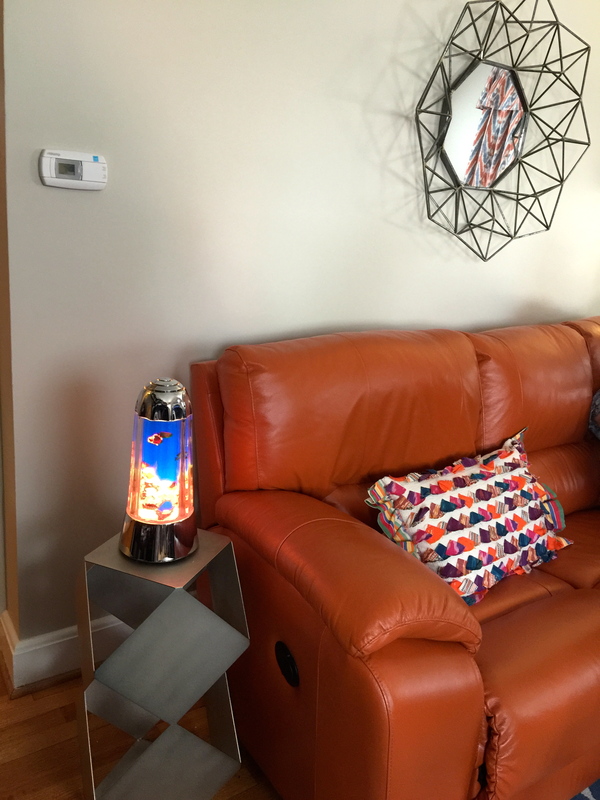 A light producing speaker system creates not only a varied auditory experience but a fun visual experience as does a lava lamp and the custom made overhead light fixture. Other senses are stimulated by scrumptiously textured blankets, a touch friendly fiber optic lamp, scent diffusers and scented hand lotions, Girl Scout Cookie flavored chapsticks, and an entire shelf of thoughtfully selected and donated nail polish. I go back and forth – is it nail polish or is it art? It has been an honor to be able to work on this project with Cyrel and her family. Experiencing their strength and the generosity of so many people who contributed their time, or their products has been profoundly moving. My many thanks go to Make A Wish of The Mid- Atlantic for this amazing opportunity. To learn more about the ways they enhance the lives of children and families click here. 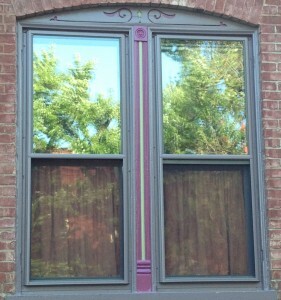 Next came the outdoor paint trim, Kasbah ( see what I mean about the names?) with Mulberry for the door and spring green for a little accent. 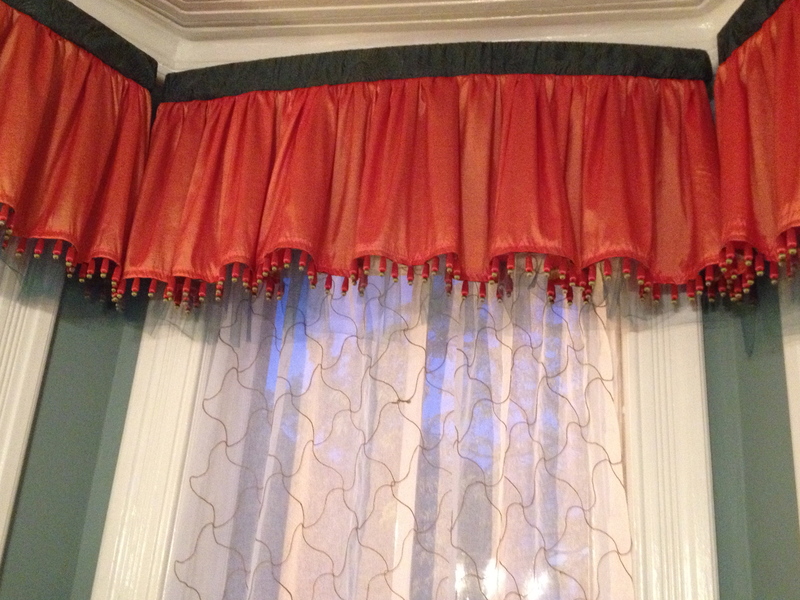 New valences and curtains in the dining room were underway before this company prep came along but here they are, kind of like a Parisian inspired ballet skirt with the dark turquoise tulle peeking out the bottom. A bit of cleaning and I was done. Except apparently too early, as I had time for one more project. 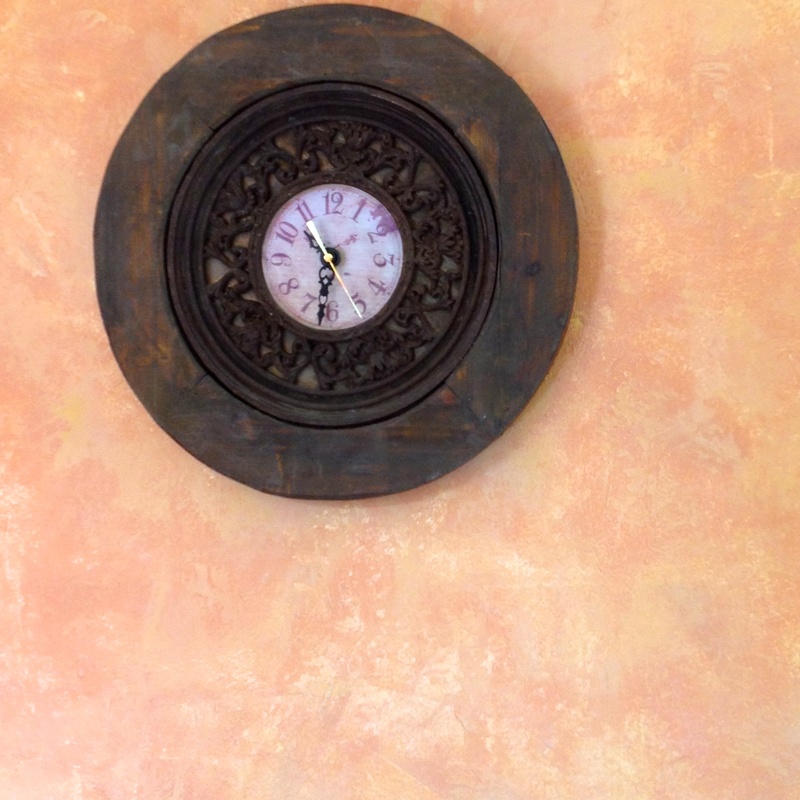 Here is the Venetian wall plaster treatment I applied to my kitchen three days before the tour. While it came out very different from my test board, ( why does that always happen?) I love it. I might even cook in this kitchen now. But I must make one final confession, my favorite parties are the pot luck – casual ones. Like when it snows hard and you invite everyone to come and bring just anything. 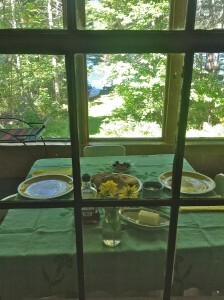 A few years back I fondly remember we feasted on six cinnamon coffee cakes! Entertaining simply feels better when the pressure is off. We just celebrated the life of my friend Mary Rush who passed away ten years ago. She taught me to just open up my door. It does not matter if the silver is polished… Just open the door and let in life. We live in a transient world. Life pulls us here and there and yet still we long for a small space to call home. I read a wonderful book recently by Xorin Balbes called Soul Space; Transform Your Home, Transform Your Life. 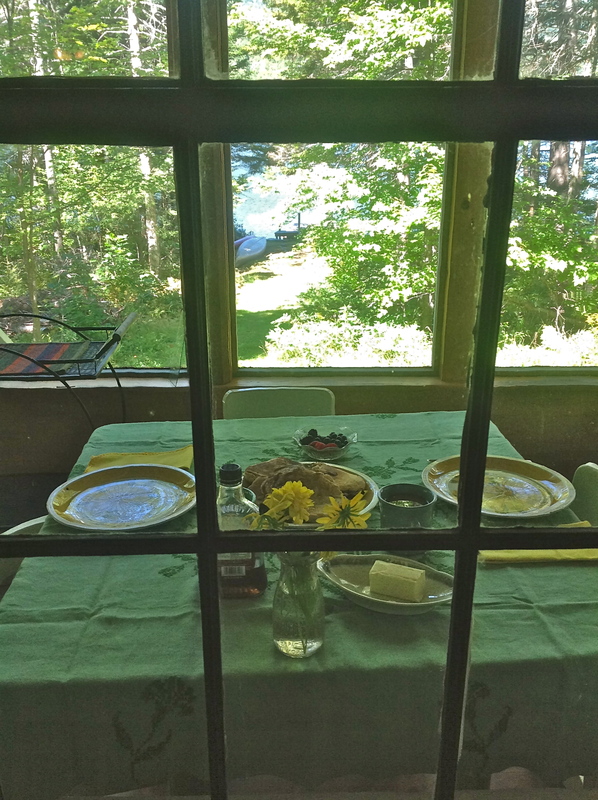 In it he writes about his partner’s uncanny ability to create home in the most inhospitable and temporary of spaces. It made me think about my daughter’s upcoming move to New England. She planned to rent a room in a house and we began talking about what to bring to make it feel like home. 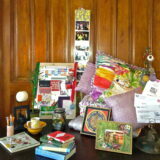 The picture above represents the things she pulled out as her favorites; Her colorful snuggly comforter, and throw pillows, a few favorite books and pieces of art, some carefully edited pictures of family and friends, a bamboo plant from her last place of work, a journal and some art supplies, a nifty jewelry or mail (or both) holder, her favorite cup and bowl, and a terrarium full of flowers holding meaning for this new path. Here are her before and after pictures of her room. She has taken a plain space and made it feel like her own cozy nest. And while I imagine she is waking up knowing she is in a new place, with an unfamiliar bed and a completely different view out the window, she has the comfort of her own sheets and pillows and these bits and pieces of her former life to ground her as she floats into an unknown future. 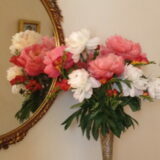 You can make even the most temporary of spaces feel personal by placing your hat on the dresser, a bunch of posies in the bathroom glass and your books and magazines by the bed. If at all possible, bring your own pillow in your favorite colored pillow case so as not to leave it behind. Settle in and enjoy your new surroundings. It is so hard to say good-bye to vacation and leave behind sensations in which you reveled. 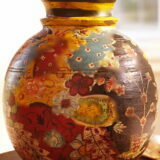 Why not bring some pieces home with you to invoke the memories and call up feelings that you experienced? My dear friend Pam has several ways in which she does this. 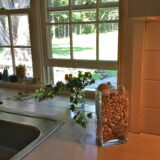 On her kitchen counter stands a tall vase of stones collected on a recent trip to the Greek Islands. 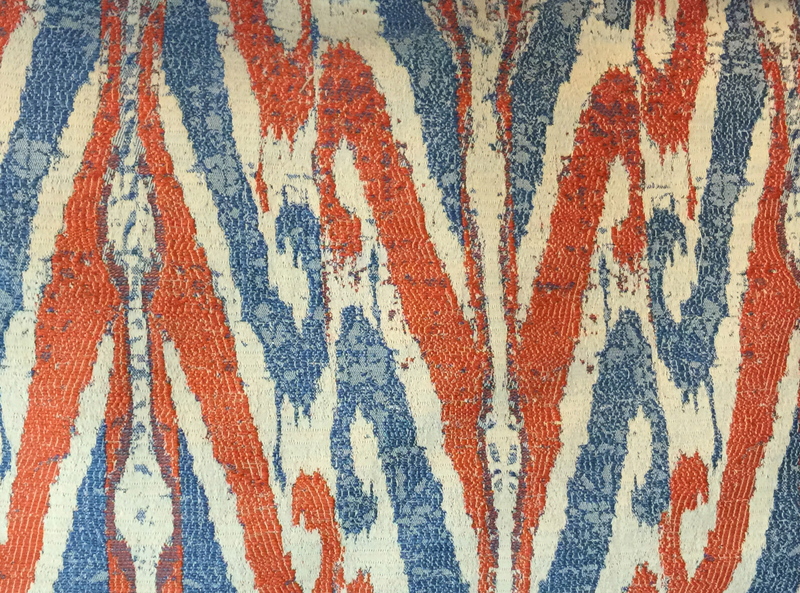 This stylish accent conjures up the feeling of warm sand sifting through her fingers. 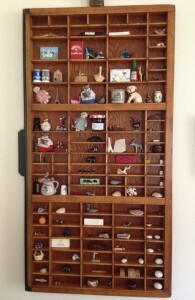 She also collects small water colors (sometime inexpensive cards) from places she has traveled. 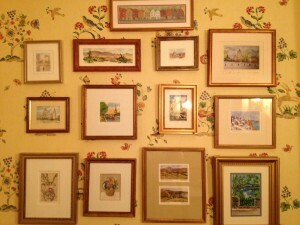 Framed at home in her powder room they create a charming wall of stories fondly remembered. 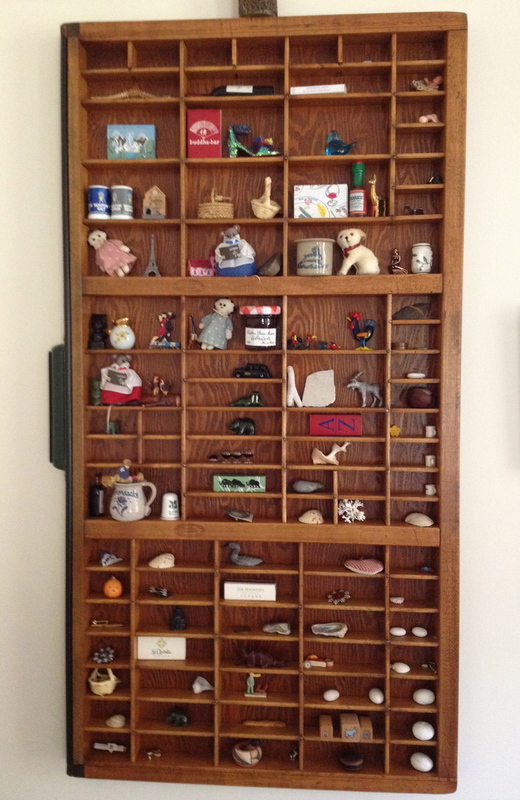 I am particularly jealous of her printers box filled with small trinkets from all over the world. (Perhaps because she and our friend Linda have such a good time picking these things out.) I keep thinking I am too late to get in on this but of course it is never too late to shore up memories. I often think of memory as existing in layers; usually the important and current stuff stays on the top, easily accessible. As their urgency lessens they drift down to be replaced by other more important events. It becomes easy for the amazingly evocative Tango performance in Buenos Aires that truly thrilled you to slide further and further out of mind. Tangible reminders such as tiny tango shoes can pull these special memories back to the surface and allow us to delight in them once more. My suggestion; bring back something real, an actual souvenir ( French for “a remembrance”) a rock, a shell, a picture, and put it someplace where you will see it often. When passing by give yourself a few seconds to remember, and re-experience the vacation sensation. Eating in the open air is such a treat. Wine, Cheese and Cherries on the dock; a picnic of bread and cheese, pancakes on the porch; what could be more delightful? I think the reason we don’t do this more often is because it seems like too much work. The path of least resistance leads to the kitchen table. My suggestion… simplify. 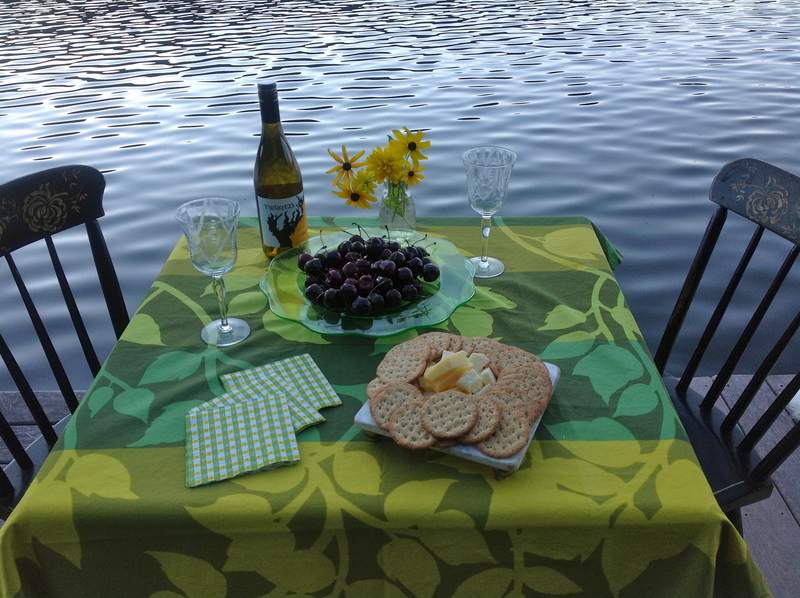 Nothing has to be perfect or even match, in fact it can be more fun to spontaneously throw an old tablecloth on the picnic table and bring out your mismatched plates. Tie up a small bunch of wildflowers or scatter fall leaves for your decoration. When faced with their parent’s divorcing most children feel a frightening lack of control. Of course they need lots of reassurance about how this was a grown-up decision having nothing to do with how much both parents love them.